Interviewed made on the occasion of the exhibition of Anthony McCall at BCubico, Recife and published during Spa das Artes, within the Museu de Arte Moderna Aloisio Magalhães. Yann Beauvais : In some of your early films such made after Line Describing a Cone(1973), Conical Solid (1974), (I can’t remember if that was the case with Partial Cone(1974), the rhythm were different ; faster, and more using some flickering effects. The crossing and closed rotation of the cross was like a projection of the Maltese cross of the projector. Were you not satisfied with the type of spaces, lines configurations these speeds were conveying ? 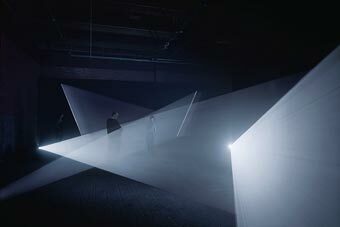 Anthony McCall : The form in Line Describing a Cone is defined by a membrane of light that gradually traces the outer surface of the conical form ; Conical Solid (1974, 10-minutes), made a year later, attempted to describe the same form, but from the inside. This becomes clear if we recall the final movement, the slowest in the film. A single, flat, triangular blade of light takes five seconds to rotate on its own axis (the axis running from the projector lens to the wall). During that rotation the blade passes through the entire internal space of an imaginary volumetric cone. If the blade of light had left a trace behind itself as it rotated, after five seconds we would have created in three-dimensional space a dense cone of white light-not just the outer surfaces, but the entire form. Hence the title Conical Solid. Of course, this cone is never there at any single instant, only incrementally and only in the mind. And the idea I have described gets a thorough workout because the film is composed of eight sequences. Each part rotates at a different speed, starting fast and ending slowly. To achieve the illusion of a smooth rotation, we need a minimum of 36 frames (one and a half seconds). But I begin with a rotation speed that is so fast that we only have four frames to define it. We perceive this as the rapidly pulsing cross you refer to. Gradually, the rotation speed slows down enough that a single rotating form becomes legible, but that isn’t until the last two or three movements. So the film is produced from a collision between the idea of the rotating plane and the limitations of the 24-frames-per-second film strip. yb : The use of the cross in Conical Solid has reappear in later works using double lines configurations, or multi-projection such has in Doubling Back (2003) Between You and I (2006) ; are these works an extension of long Film for Four Projectors and Four Projected Movements (1974) ? AMcC : Although both early and late works are based on membranes of light projected through three-dimensional space, Doubling Back (2003) and Between You and I (2006) are perhaps a little different from the solid-light films of the seventies. The earlier works are built from one single form. The later works are built from two forms acting on one another. For instance, Line Describing a Cone (1973) comes from a single circular line, Conical Solid (1974) from a single line that successively changes position, and Four Projected Movements (1975) from a single line that rotates slowly through 90 degrees. 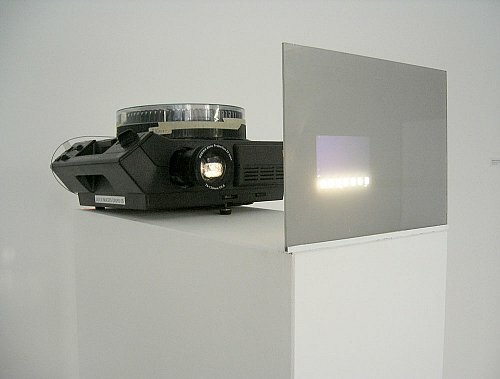 The whole of Long Film for Four Projectors (1974) is constructed from a single, slanting, straight line which passes repeatedly through the frame. But the new series, which I began after a twenty-five year pause, is not quite as simple. 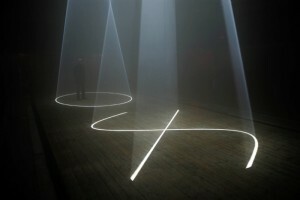 Doubling Back (2003), for instance, is built from two travelling wave forms that pass through one another and thereby create an irregular, mutating object ; and Between You and I(2006) is based on two dissimilar forms (an ellipse and a travelling wave) which, using the cinematic device known as a “wipe”, are brought into shifting juxtaposition with one another, again creating an irregular and rather unpredictable new object ; “Between You and I” is also profoundly different in that it’s axis is no longer oriented horizontally ; it is a vertical form, 10-meters tall, with the projector high up, projecting downwards onto the floor. 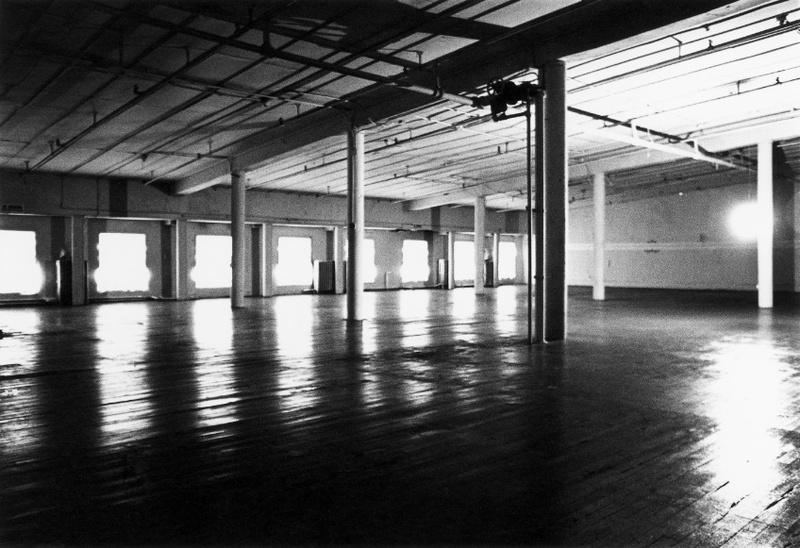 yb : When I am thinking of Long Film for Ambient Light (1975) it conveys some early works of Michael Asher in which the ambient light of the space gallery was questioned, did your partake some aesthetics with him ? As the text you wrote in 75 could inform us : « I am now interested in reducing the ‘performance’ aspect, in order to examine certain other fundamentals, viz. Temporality, light. I am presently assuming that it is possible to do this without using the customary photochemical and electro-mechanical processes (which have the disadvantage of being expensive, i.e. slow). AMcC : I came to know of Michael Asher’s work rather late, which I regret. Richard Serra was the first person to tell me about it, I think around 1975, but it was some years after that before I actually saw anything. A very interesting artist. yb : Did you know the installation work of Paul Sharits ? Did you have any relation with him ? These two questions come from the fact that I have the feeling that exist some relation between your works despite their differences. AMcC : I met Paul Sharits sometime in the mid seventies, and I before that I knew of his work through live screenings in New York. I don’t recall precisely, but I think that I saw photographs of his installations before I actually experienced them, probably in the catalog of a solo exhibition of his work written by Regina Cornwall. Paul and I spoke at the International Forum of Avant-Garde Film in Edinburgh in 1975, and we were both in Documenta 6 in 1977, which I think may have been the first Documenta to show both avant-garde film and artists video. There are undoubtedly affinities between his work and mine ; we both pursued a reductive, materialist aesthetic and, as you observed, both of us developed or moved into installation, and this was before there was the technology (or indeed the context) that could really sustain it : however extended those installations were in time, they still required the full-time attention of live projectionists, making them a kind of extended performance ; nowadays, installations are typically made of computer-managed video projection. yb : In Miniature in Black and White, 1972, a work optically challenging, one could feel an aspect of immersion despite the small size of the work, it is an intense piece. We are in a situation where the audience is facing at the eye level a challenging sequence of black and white slides ? Were you working with a specific pattern in mind ? Have you too watch the piece from beginning to end, or is it like an installation in which you take it when you are facing it ? AMcC : Miniature was conceived from the very start as a continuous installation, an object in a room, with a temporal structure that was repetitive ; it assumed a mobile spectator who would decide for himself how long to stay. The Kodak Carousel Projector enabled this approach, with its circular magazine that could seamlessly project and re-project 81 slides contained within the circular magazine. Plus the Carousel was designed for exhibition use : it was built to run 24-hours a day without overheating. It was a tough little machine. I see this work as pre-figuring Line Describing a Cone ; the small screen with its tiny, back-projected images was only 10 or 15cm from the lens of the projector, and the observer was facing that screen with the projector immediately behind, and looking at stark images made of white light. In fact, all I had to do to get close to the configuration I used for Line Describing a Cone was to remove that tiny screen, leaving the observer looking directly at the projector. Miniature in Black and White was completed early in 1972, and Line Describing a Cone was made in the summer of 1973.
yb : Another things that I am aware with this piece as with Line Describing a Cone(1973) and Long Film For Four Projectors (1974) is the presence of the apparatus (the noise of their performance) which produce/make the piece live at the precise moment we are seeing them. Don’t you think you are loosing something on that level with the digital pieces ? AMcC : When I began making these films again in 2002, using digital means, this very problem worried me. You are right about the sound. The rhythmic clattering sound of the Carousel projector changing slides, with its cooling-fan undertone is an absolutely integral part of Miniature in Black and White. Similarly, the rhythmic mechanical whirring of the 16mm projector (or projectors) creates a kind of drone tone, an ambient atmosphere for the installation. This has the important effect of masking voices, which creates a kind of acoustic privacy for the observer. By contrast, digital projectors, computers etc, are relatively silent, though you now hear the puffing of the haze machines. But in the 70s making films without a sound-track seemed an obvious part of the rendering down of the medium ; and it was precisely because of the deliberate absence of a constructed sound-track that the ambient sounds of the apparatus became foregrounded. Currently, image and sound co-exist within the same digital medium and there now seems no necessity to ‘expel’ one of them. So sound for me has returned as an aesthetic question. yb : Miniature in Black and White was made at the same year as Interface by Peter Campus which include the audience within the circuit of the piece, while your include our eye, as a reflection, but the full body as a stand. AMcC : I remember first coming across Peter Campus’s installations at Paula Cooper Gallery, in SoHo, I think, in the mid or perhaps late 70s. The presence of just a video projector quietly projecting an image of your face onto a wall in an almost dark room in real time, very large and perhaps upside-down (I recall such an installation) created a very new possibility : there was a silence to it which I remember appreciating : this alone set it apart from film, which always carried with it that mechanical whirring sound, as well as – usually – a finite duration. The other quality, of course, that set film apart from video then was that they were largely seen in different contexts. 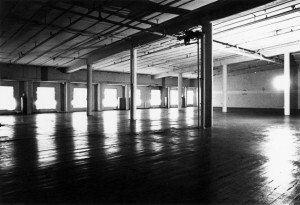 There were exceptions, but on the whole film was seen in avant-garde film places and video (Campus, Acconci) was shown in galleries. yb : The question of duration is important, as much as the flawless, the continuity of the performances ; if one think of SoundStrip/FilmStrip and Long Film For Four Projectors, (1974) one perceive that it is humanly impossible to get over the works. One can see what it is about, understand how it works but one can’t experience the full length of it. Is it even necessary to experience the full length of them ? The question of its experience is informed through an analysis of its process, and induced other levels of interaction with the works. The question of the duration emphasized the idea of the placement of the body within the piece, within the space where the work is evolving. Were you taking into account all these parameters when making them ? AMcC : During the seventies I gradually increased the length of my fire performances and my films because I wanted to escape from the expectations of an assembled audience. By making a work last five hours or all day or all night, the audience as a group ceased to exist. That audience was replaced by individuals arriving and leaving when they wished, and deciding for themselves how long they would stay. 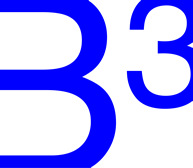 An extended duration required a different type of structure, a non-narrative structure, and this is when I found permutation to be a useful tool. Perhaps Long Film for Four Projectors(1974) realized this most successfully. I thought of the spectator there as being surrounded twice : firstly by the duration which was so extended that it outlasted any individual’s attention ; and secondly by the spatial arrangements of the installation : if you were in the room, you were absorbed within the spatial field of the film. yb : Another relation has to do with the scoring for the pieces, before and after their making. As a filmmaker I understand the purpose of making after a completion of a piece because, often in the making what was planned very often is altered, but I don’t think that is your motivation to do these drawing pieces, or is it ? AMcC : Whatever else they are I think of these solid-light works as drawings from beginning to end – even, or perhaps especially, at the moment of projection. There are the preparatory drawings made in notebooks where I work out a three-dimensional, sculptural idea, or follow the logic of the piece in the form of a two-dimensional story-board ; then there are the instruction drawings I prepare for my programmer, which resemble a score – with detailed sketches, measurements and time-schemas. Then after I receive the programmed animation interface I spend sometimes months projecting, constantly changing the various values embedded in it. Finally after a work is finished, it often offers up aspects of itself that I hadn’t thought of or noticed before. I like to produce follow-up drawings that explore these sorts of revelations. yb : The relation to sculpture and the organization of the image within the space is important, but often you require the black box, and in that sense could we say that you are still making film ? AMcC : These pieces operate in a zone that includes both cinema and sculpture, and perhaps even architecture. Not having to choose one of these but being able to draw on each in different ways and different proportions is a great freedom. I can say that I am still making films, but as a description it does go quite far enough. yb : You always convey the body in your work, being the position or size of the projected form ? But also in some of your titles (Between You and I) there is aspect of negotiation between the work and the audience, but also between different member of the audience sharing or discovering the piece. Is this so ? AMcC : Yes, I think so. Obviously, there is the exchange that takes place formally between the graphic elements. But then there is the exchange that takes place between the observer and the piece, which at one remove is an exchange between myself and the observer. Then, as you noted, there is a negotiation between the spectators themselves, as they move carefully around in the dark ; also, each of them becomes part of what others look at, which effectively turns their actions into performances. Work titles like (Between You and I and Meeting You Halfway hint at these different relationships. yb : The idea of performance is important in your work, being films, drawings, installations, but its reading is more obvious in the simpler pieces such as Landscape for White Square, Earthwork, Line Describing a Cone (the two version) You and I… ; they seem somehow more related to our understanding of what is happening, while the other ones tends to direct us towards other directions, and issues, contemplation, not producing a solid meaning, but not facing a chaos, just floating in between, on the edge of disorder and process. Is question of meaning becoming more important in relation to the repetition of the cycle, of the piece ? AMcC : I am interested in what people find in these works ; but this doesn’t really inform new work. I suppose that I consider the meaning of a piece is something that is created by the spectator in their engagement with this formal object, not something that I place there to be found. ‘Floating in between, on the edge of disorder and process’ sounds like a good place for a work of art to be ! yb : I found stimulating the relation one can draw between Long Film for Ambient Light and the bridge project, the question of the cycle, day, year inform us of this impossibility to experience the work in its entirety, but at the same time gives us the possibilities to experience different moments. We have a physical fragmented experience of it while we have a more entire experience of it on a conceptual level. AMcC : Yes, installations like Long Film for Ambient Light are extended over a period of time that is so long that it must outlast the spectator’s attention. As a result, the piece is experienced physically as a kind of fragment or sample. My proposal for theCrossing the Hudson, turned the 1-kilometer wide, deserted, Poughgkeepsie railroad bridge into an armature for a light piece, whereby the bridge would be lit up, very gradually, starting from the left bank of the Hudson and moving to the right. It would take six months for the bridge to pass from dark to fully lit, and then another six months to pass from being fully lit to being dark again, and so on, ad infinitum. I see this work of art, massive in scale and with a time structure of one year in repeating cycles, as being ‘embedded’ within a place ; for those living in the region, the understanding of the structure would come quickly ; the pleasure would be in the occasional glimpses of that structure at different moments, different seasons and different times of the night, not to mention (given that the piece would ideally be permanent) different times in ones life. With work in public spaces there is also the intriguing possibility of the ‘accidental’ spectator, which cannot happen within an art institution since a visitor there knows that they are looking at ‘art’. yb : In your first performance films (Earthwork, Landscape for Fire) the sound is shaping the space as the lines do in the later works. In all your light installations the sound only comes from the audience and its interaction and from the environment. 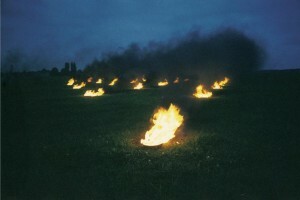 Is the absence of sound a prerequisite to experience the work ? Is the space that sound conveys or requires opposite to the experience of your work ? Will-it disturbed our perception of the work ? AMcC : I used to think so. But as I indicated earlier, to expel sound in order to maintain the purity of just looking or the purity of the medium, now seems arbitrary. And yet I dislike so-called ‘immersive’ audio-visual environments in which you are expected to lose yourself. I believe in a receptive but self-conscious, thinking observer. yb :In 1978 and 1979 you made two talkies films, both of them were collaborative work :Argument and Sigmund Freud’s Dora, both of them were dealing the production of meaning. Was it necessary, for you, at that time to invest other fields, escaping from the abstraction of the solid light films ? In Argument the political dimensions is directly present, that dimension is less obvious in the more abstract work. Are these works engaged with a critique of the precedent work you did ? Could you speak about these matters ? AMcC : When Andrew Tyndall and I made Argument there seemed to be an urgent problem. The world of avant-garde film was cut off from the real media and political world surrounding it, with tiny audiences consisting mostly of other filmmakers. Typically, you made a film then showed it to your peers and discussed it. We decided that we would start with our given audience (ourselves) and initiate a dialog by making a film about the problem. The project included not only the film but also the publication of a small book of critical writing and structured discussions after each screening. In retrospect both projects were part of the same ‘institutional critique’ impulse that produced the work of the “pictures” generation, being made at the same time. “Sigmund Freud’s Dora” was made the year after Argument, with an extended group of collaborators. In some ways, Dora was the more successful of the two, precisely because it was of interest to additional audiences : not only avant-garde film people, but also those interested in feminist film theory, and those interested in psychoanalysis. It succeeded in moving out of the narrow confines of the avant-garde, but at the price of moving into the confines of the Academy ! As things stand I haven’t returned to the ideas in these projects, but nothing is out of bounds. Cette entrée a été publiée dans Cinéastes / Artistes, Ecrits, Interviews, et marquée avec expanded cinema, installation, le 2 mars 2014 par yannbeauvais.